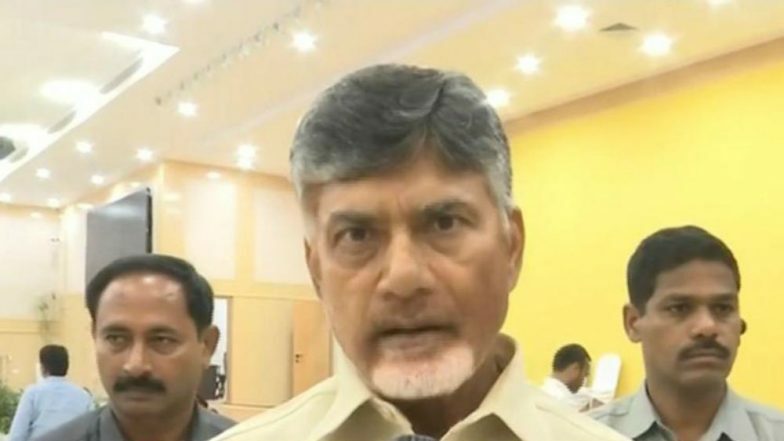 Amaravati (Andhra Pradesh), April 14: The Telugu Desam Party (TDP) has responded to the Election Commission of India's (ECI) letter expressing displeasure over the inclusion of Hari P Vemuru, an "EVM theft accused", in the Chandrababu Naidu-led delegation that met the poll body yesterday on alleged malfunctioning of electronic voting machines (EVMs) and VVPAT during elections in the state. EVM Row: Chandrababu Naidu Demands 'Return to Ballots', Says Election Commission Working on 'PM Modi's Instruction'. As per the letter written to the TDP by the ECI on Saturday, Vemuru is "involved in a criminal case regarding alleged theft of EVM machine in 2010, for which an FIR was filed at MRA Marg Police Station Mumbai." Responding to this claim by the ECI, the TDP stated in a letter dated April 13, "We would like to state that instead of focusing on the issue, the Commission is trying to avoid the situation. "It added, "The ECI is not willing to discuss with him stating reason of the criminal case, while on many occasions he attended sessions on EVMs. "Yesterday, Naidu met officials of the ECI over the issue of EVM 'malfunctioning' in the ongoing Lok Sabha elections. EC Writes to TDP, Questions Presence of EVM Theft Accused in Chandrababu Naidu's Delegation. Naidu demanded the ECI to revert to ballot paper system immediately to "preserve the sanctity and protect the spirit of the electoral process and democracy. "On April 11, after polling in a few districts of Andhra Pradesh was disrupted briefly due to malfunctioning of EVMs, Naidu had requested the EC for an extension of polling time in the state to compensate for the time lost due to technical glitches. Voting took place for all the 25 Lok Sabha seats in Andhra Pradesh and for its 175 Assembly seats on April 11. The results will be out on May 23.